Google GOOG (NASDAQ) is the go-to source when looking for information from best diet to follow to real estate to acquire. 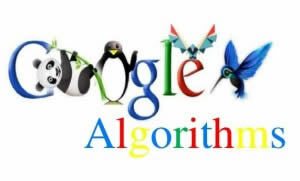 Google is a dynamic company and has been updating its algorithms consistently with hundreds of submission each year. Website operators are scared of those updates, as they can never know what Google can change and how it may affect the business operations. Google provides the summary and direction of updates but is vague on the details and effect on the ranking. There are many examples of the website being downgraded from leadership positions to lower places in the search results. The reasons vary, and each major Google update brings fear to the real estate website owners. According to MOZ , some recent updates had a direct effect on the real estate websites. It is hard to estimate the difference in ranking as Google updates don’t take effect overnight. Some websites see the changes sooner than the others while the search results being indexed and re-indexed. When Google updates its search algorithms, website owners will try to stay on the top of search engine results or get to the top. That practice is known as SEO (search engine optimization). You are lucky if you saw improvement in your real estate website ranking and higher Alexa score after the changes took effect. That means that Google considers your marketing strategy good and following its policy on search engine optimization. On the other hand, if your ranking and traffic to your real estate website dropped – you are now one of the website owners who is concerned with Google punishments of their web presence and have to implement changes to become the Big G favorite again. A good real estate SEO strategy can sustain Google updates and at the end come out even stronger. There are no miracles in this process, and search engine awards those companies who do the right thing. There used to be plenty of techniques to boost the rankings that are now considered illegal or black hat SEO. Those include excessive linking to sites with high PR, even with unrelated content, invisible text and keywords to the whole encyclopedia and many others. Now Google rewards the real estate website that provides the material that is interesting to read, well written, unique and informative so that the readers can spend more time on the page. It is essential to make sure your website low content that can hurt the ranking. Real estate websites can successfully leverage by implementing IDX (RETS) data streams to enhance their content and coverage. If you have used content syndication, that is reposting someone else’s articles with the link to the source – it is best to eliminate such information as soon as possible. Google has punished such practices with Padna 4.0 update and downgraded real estate website that was using such methods. The recent Pigeon update actually can be rewarding to real estate website if it has a well setup local presence. This includes company Profiles on Yelp.com, Foursquare.com, Google Local, City Search and other directories that encourage customer reviews. Real Estate SEO strategy needs to focus on local marketing, as location data, information about local markets can be beneficial for consumers and help them find the answers to their inquiries easily. 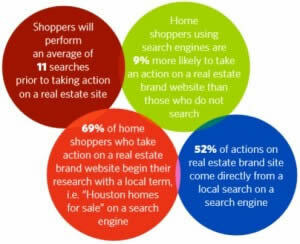 Recent NARS study ”The Digital House Hunt” found that shoppers will perform about 11 searches prior to taking action on real estate website. They are also more likely to use local terms as “Miami Home for sale” on the search engine. Many real estate website writers have established the name in the industry and promote their profiles as authors. Recent Google update removed authorship markup, including photos. It is unknown if there is an adverse effect on the real estate websites with favorite writers who established a fellowship over the years. Many SEO professionals consider it not harmful, however not beneficial. The writers are furious with this changes, as Google was encouraging the authorship markups before and they built an online reputation by consistently delivering content to their readers. Now Google decided to back off its original policy and changed gears. Another recent Google update is related to secure certificates on real estate website. Updating from ‘http://’ to ‘https://’ in the website URL address shows a more secure protocol on the internet. It sounds easy but requires redirection to the new address and can be confusing. More so, some of the e-commerce sites do not work with security protocols and will need yet another update to make the process smooth. Real estate websites need to concentrate on local markets and bring expertise to its customers. People would use local terms in search engines, and the local source will deliver the detailed information with up-to-date pictures and videos. It is also essential to have a mobile site. 89% of new home shoppers use portable search engine throughout their search. Realtors can employ various marketing techniques for mobile users to make sure that they are on the internet.